Situated overlooking the harbour, with great activities and amenities on offer, this is a popular choice with many returning guests. set in a quiet location with a sandy beach and choice of bars and restaurants nearby, families enjoy the friendly atmosphere. Remember this is not a 4* hotel and accept there are fewer niceties, such as porters to help with luggage, no kettles in the rooms and having to pay for a mattress for the sunbeds. When paying for your safety deposit box note you have to pay cash and build this into your budget. Although there is a notice on a tree by the pool stating no reserving sunbeds with towels, no staff police this request, so if the hotel is busy it's fight for your bed, which can wind you up when you have gone to the trouble of going through to reception and paying the 1:50 euros for a mattress only to find limited spaces and not the most favourable positions, sorry to say this was mainly English guests who abused the system. The hotel has various forms of entertainment around the pool throughout the day with a hard working animation team who keep the children amused and also encourage adults to join in the activities, they encourage but do not pester, accepting a "No thank you" and moving on. I was there the week before Christmas and Christmas week and saw two sides of the coin where bars and seating for the entertainment were concerned. First week, no problems with service or seating, but the second week was very different. One night I counted 15 people in a queue for the bar with only 2 staff serving, not good and of course this moved on to the entertainment area, resulting in not enough tables and seating, but it was Christmas week so it could happen anywhere. The restaurant was very large and self service. If I had to say what let the hotel down I would have to say the food, but there was never a day I could not find something I could eat, I just don’t want to see chicken again for a while. All in all this hotel gives great value for money and if you accept this is NOT 4* there's not a lot to complain about. The position is good, being close to the beach and shops plus the Sunday Market so if you fancy a walk around there's plenty to do and see. I found all staff obliging and polite and I am seriously thinking of spending longer there next Christmas. Hotel tip: Upgrade to superior room, Higher up and therefore quieter, much larger. Don't keep your key card anywhere near a mobile phone as it can strip the information from the card which I found out to my cost as I was on the 13th floor. We have stayed here 4 times now, and we will keep going back. So far we have had family rooms, Standard room, Room with sitting room, so we only need to try the superior one to have a full set. Always managed to get a seat in the restaurant, food not always as warm as we would have expected, but there was always something to eat. Entertainment was fantastic, both that provided by the team, and specialist acts. The hotel which has recently had a facelift, was clean and tidy, and the staff worked very hard, and were always pleasant. We stay at this hotel 3 times a year and love it. We took the family with us this June and they also were impressed for the value this hotel offers. Hotel is in a great position for all amenities. The staff are very helpful and always look after us with our requests. We will be back November. We have stayed at this hotel before but it has since been refurbished. We had a fabulous room overlooking the sea - we have stayed in smaller apartments! The location is excellent, right by the beach with plenty of bars & restaurants nearby. The staff were all friendly & helpful. There was plenty of choice at breakfast, although not all of it to our taste but you would have to be really fussy not to find something you liked. 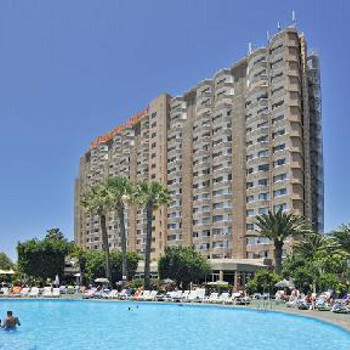 The outside areas of the hotel are first class with two separate pool areas & several terraces. We never had any trouble getting a sunbed. All in all an excellent hotel. Generally very satisfied with the hotel except for the 'extras' we had to pay for and the food. The canteen was noisy overcrowded and the food especially the vegetables was not three star star standard. We learn that the hotel had changed hands recently and food had greatly deteriorated. We discovered we had to pay 20 euros a day for air conditioning, 35 euros a week for a fridge, 15 euros a week for a hair dryer, 1.6 a day for a safe, 1.5 per sun bed per day. The bed and the door were provided free thankfully! On our previous visit to Tenerife we had stayed in a four star hotel where all these extras were included. By the time we had counted up the cost of these extras we had paid more for a poor three star hotel with much inferior food! Will certainly be back ! Stayed at Princesa Dacil for 17 nights before transferring to apartment. Stayed there before and will definitely go back. All staff were brilliant from start to finish. Went half board but upgraded to All Inclusive. Some people moan about food and staff but they must eat at Savoy everyday when in England I presume. The staff take alot of stick from moaners but in main they just smiled and got on with job. Hotel is perfectly placed for everything, bars, beach, town, buses the lot. I will be back without doubt. well we did go in may, hotel is old and tired in parts, but we still had a great holiday,the hotel rooms were very clean and we always found things to eat at meal times,the main problem is the lack of staff in the restaurant(this improved towards the end of our stay ) and the main bar sometimes only 1 or if lucky 2 people serving,this didnt really matter to us but the people on AI were really fed up.The entertainment could have been better,but the animation staff we met were really nice and activities were arranged for the kids,mine especially liked the pool games and the crazy mat organised by Philip . princesa dacil is a lovely hotel,clean comfortable .food was plenty with lots of choice,the fish is the best i have tasted,desserts very good especially the ice creams,location only 200yds or so from main walk along promenade,staff at front desk very helpful and polite.entertainment very poor,expected comedians,singers etc, got young people ,eagles and snakes although the organ player was ok. Arrived on the last day of the recent storms.I had rung the hotel beforehand to ask for a particular room which we got. The reception was busy and not well organised. The dining room for dinner was busy but the food was very good. The choices were varied with a lot of fish which was fine. A fresh grill and a roast every night. However the breakfast has terrible as seems to be the norm. Streaky bacon soaking in fat, hotdog sausages, toast machine that took for ever.The entertainment is targetted at the older generation with bingo and ballroom dancing every night.I know it is winter but the outside pool was too cold to swim in, with the price we paid i think they could afford to heat it.The hotel location is fine with access to the promenade and local ameneties. Just arrived home and we found the weather and hotel most relaxing as it was in the 80's. However food we found was not that marvelous, sometimes we had a job to find something we liked although we are not fussey eaters. It was not always displayed to look tempting and the slops in front of the food were not wiped. We found very few staff in the restaurant and the chef doing the omletts was also sorting out the tea/coffee machines. We never found hardly any people in the bar and as the hotel was only partly all inclusive we found that the people who were not fully inclusive didn't want to sit with us. We did book only five days before we went but had a very nice large room overlooking pool and the sea in distance and was kept very clean. The entertainment not much alright if you liked Eagles and Snakes but the keyboard player was good.